I had hoped this day would slip by without a thought of four years ago. But then I had a dream nightmare two nights ago. A little reminder that it’s still in my brain. My post from last year better explains it. Three Years Ago Today. As I write this, I’m still not so sure I should be posting it. Once it’s “out there”, if there was ever a thought of our normalcy, it’s about to be forever gone. Here goes…..
After my car accident, surgery was required on my knee. It was minor and outpatient, but still not something I would want to repeat. Our kids lived a couple of hours away and were concerned. My youngest called and asked that we send a picture. He had experienced the same surgery and knew what to expect. If you’ve ever had a torn meniscus, you know there is no “picture”. No scars to show off once it heals. Boring. Surgery knee by Doctor C.
But we were bored that evening…sooooo, with hubby on board, we had a little fun. Add a little eyeliner and catsup and our cell phone photos became much more interesting. So did the reaction. The last picture, sent a few minutes later, told the tale. 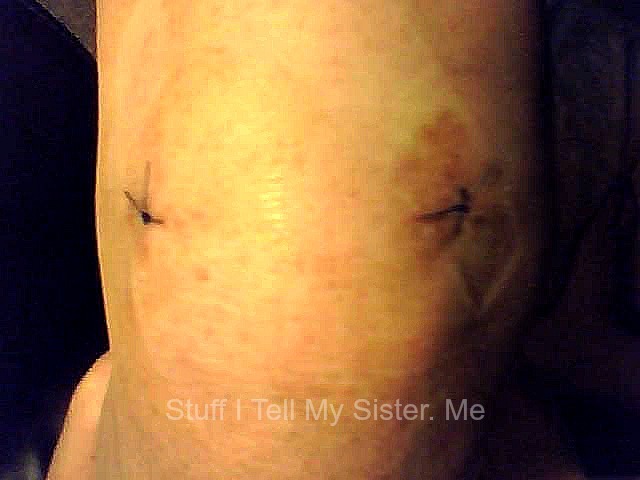 And in case you were curious….it was my “good” knee that we adjusted. The kids eventually spoke to us again. But for a moment, my son was about to get a certain surgeon on the line! I love that he loves me that much. Still. While on the subject of automobile accidents. I know that when a person “witnesses” an accident, it can turn into a huge undertaking for them. But I have been in two accidents and both times, if not for the gracious witnesses, my ordeals would have been much more difficult. If you witness it, stay and talk to the officers if at all possible. You would want the same if the tables were turned. This entry was posted in Family, Forgiveness, Humor, Medical, Reflections, Relationships and tagged accident, car accident, dogs and knee, fake knee scar, Four years Ago, humor, Knee, knee surgery, Tear of meniscus, teasing kids, We are weird, Witness. Bookmark the permalink. 64 Responses to And Now FOUR Years Ago Today…. So happy you added the comment about witnesses standing by to make a statement. It can make akk the difference in the world. Glad to hear that you do kooky things once in a while. I don’t feel so alone! Oh Momma, there is so much to be said here. I know it’s horrible to be in an accident, but that joke you played on your kids was priceless!! It sounds just like something my husband and I would do :). Nice one!! Sorry to hear of your accident and that you needed knee surgery, but the joke you played was HILARIOUS! Although, it doesn’t quite seem like the kind of joke parents play on their kids, more like the other way around. Awesome! We are twisted, Maggie…..and now you know. ;( It was just what I needed that evening, though. To LAUGH! You got *me* Paula! LOL!! I looked at the pictures before reading. So sorry to read that you had such an accident, but I can’t stop laughing. not to mention that it is illegal to leave the scene of an accident that you have witnessed, at least in Canada! There are so many people who just do not want to get involved. And I GET that. Court, depositions….no fun involved. What I hated more than anything was that I could not “properly” thank my witnesses until the case was settled two years later. I am forever grateful to them! Yeah the law is a funny thing-glad you did finally get a chance to thank them! Love you passion … and your laughter. Glad that you have recovered so well as you have – for me seams very odd that anyone would leave an accident behind if … they were witness to the accident. Thanks so much….and I’m with you….those that checked on me and called 911, I hold dear. There are good folks out there…. I hope of all my heart that we all will do the same … call for help and stay with the victims – until help arrives. So happy over your recovery. Oh, you wicked things 😉 you’re right about witnesses – without them at times life just gets even harder. I seriously laughed forever at that, though. I’m sure your son was FREAKING out.. hopefully he can see the humor in it now, though 😉 haha. You are a bad girl Paula, but I love your humor!! So glad the kids forgave you! I am, aren’t I! haha…. Happy Sunday, Jeannette! Your sense of comedy at such a time is great! Now the dogs licking…that had a certain “ice factor” for me. LOL! That looked nasty. I am a bit squeamish so had to quickly go past the photos before I pass out. I’m not joking. My mum had a big operation and when I went to see on the ward after her surgery, I went white and the nurses were worried that I was going to faint. I can’t watch much blood on TV, even if it is fake, my mind doesn’t think so but thanks for letting me know. That is just too funny. I had a chance to take my old suzuki for an upside down spin a few years back thanks to an elderly gentleman in a huge Oldsmobile – not a lot of fun. Nope….wouldn’t care to do it again. Upside down?!?!? And I only got to go round and round…. Oh that ice! I was driving in just a few days….p.t. took longer than what I thought it would, as did just squatting down, etc. 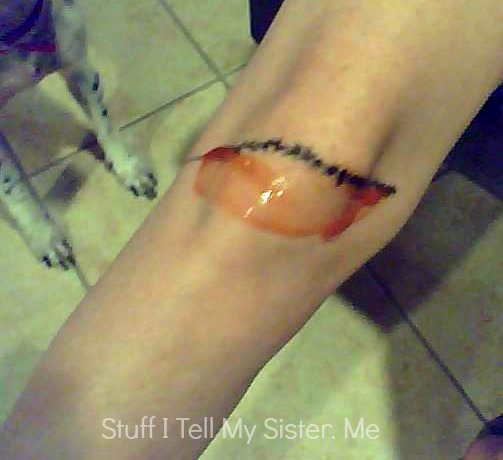 My knee hurt (and still does at times) after….but in a different way, if that makes sense. It doesn’t swell anymore. Guess what I’m trying to say is that it’s never back to “normal” again. UGH….t-boned. Glad you are okay. That’s what happened to me….but I wasn’t at full speed….she was. That’s what the doc told me too – so darned inconvenient.